Sony Xperia L1 is currently not available in any stores. 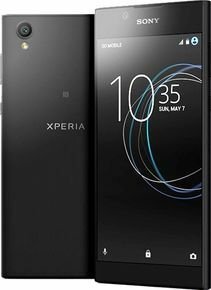 The Xperia L1 is an entry-level smartphone brought out by the company as yet another addition to its 'Xperia' line of smartphones, making it the cheapest out of all. For starters, the phone sports a 5.5-inch edge-to-edge HD display, which is also scratch resistant and has a 1.45GHz octa-core MediaTek MT6737 chipset working as the powering source behind it. The SoC is supported by a 2GB RAM and a Mali-T720MP2 GPU. The Xperia L1 comes with a storage capacity of 16GB, which the users can elongate till a maximum limit of 256GB. Along with that, the phone boots the very latest Android 7.0 Nougat out of the box, garnished with the Xperia UI. For those interested in the optics, there is a 13MP sensor on the back (f/2.2 aperture, LED flash and 1080@30fps video recording) and a 5MP one on the front (f/2.2 aperture, 24mm lens, 1080p video recording). The dual-SIM phone packs in a 2,620mAh battery, which also has fast charging provisions. The phone has already been launched but its availability and pricing are still a subject of speculation. The Sony Xperia L1 best price in India is expected to be around 9,999INR. You can subscribe to Smartprix to get news, alerts and updates regarding the Sony Xperia L1. The Xperia L1 marks Sony's return to the still growing and highly-competitive entry-level market. The L1 screen is capable of 450 nits of maximum brightness, not bad for an entry-level device. The Sony Xperia L1 demonstrated perfectly clean output when hooked up to an active external amplifier. Its loudness was very high too, rounding up a great performance here. The Sony Xperia L1 actually feels pretty nice in the hand. Its weightiness gives the impression of quality, while that matte plastic ensures that it won’t be slipping out of your grip any time soon. The phone’s power button and volume buttons are placed in the usual position on the right-hand edge of the phone, but they’re plain and untextured, so it can be tough to distinguish them by feel alone.